Duncan & James have won a Research Project Grant from the Leverhulme Trust for their proposal 'Skating on Thin Nanofilms: How Liquid Drops Impact Solids', which will fund a 3 year postdoctoral position in the Mathematics Institute at Warwick – see advert: http://www.jobs.ac.uk/job/AUB367/research-fellow-in-interfacial-flows-77087-125/ . The project will draw together theories from the previously disparate and segregated fields of capillary flows and non-equilibrium gas dynamics in order to open up an entirely new direction of research. The initial focus will be on the impact of liquid drops on solids, routinely observed when a tap drips noisily; raindrops pound the windscreen; or a coffee drop spills on a crucial document! However, is there more to impacting liquid drops than these everyday annoyances? Actually, much more. Beneath a mundane façade these flows hide a still-not-fully-understood competition of complex and diverse physical mechanisms that determine macroscopic dynamics. They are also integral to numerous technological, environmental and biological applications of fluids, e.g. acting as the building blocks of 3D printed objects or as carriers of pesticides in crop spraying. Despite substantial scientific interest in drops impacting solids, no existing theories are able to explain a raft of experimental observations. Specifically, compelling evidence, revealed in Xu et al 2005, indicates that the gas surrounding the liquid drop (a) has a critical role in determining the dynamics of the drop during impact and (b) can suppress drop splashing when its pressure is reduced. This is shown in the experimental videos below: drops splashing at atmospheric pressure (left hand video) can be suppressed at reduced pressures (right). Whilst (a) surprised many in the field, due to the negligible magnitude of the gas-to-liquid density ratio and viscosity ratio, it was (b) which was completely unexpected – and is in direct conflict with all existing theories. The discoveries in Xu et al 05 stimulated an explosion of experimental work aimed at revealing the curious details of the gas’s role. 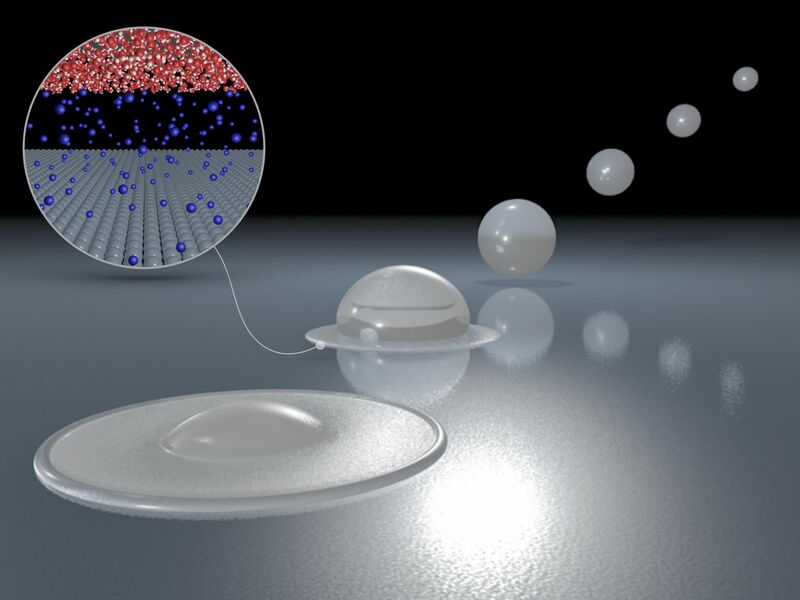 New experimental methods, based on interferometry (Driscoll & Nagel 2011) and x-ray imaging (San Lee et al 2012), were developed to capture the spatio-temporal evolution of the gas trapped between the drop and the solid surface. Most remarkably, results obtained within the last year (Kolinski et al 2014; de Ruiter et al 2015), demonstrate that under particular conditions, drops impacting smooth surfaces can skate indefinitely on a gas nanofilm (of height h~10nm) and subsequently rebound; even from wettable surfaces! These experimental analyses have revealed the incredible multiscale nature of a seemingly innocuous problem: mm-sized liquid drops are controlled by the dynamics of microscopic gas nanofilms that are 10,000 times smaller! There are now a myriad of open questions, the most striking being: what is the mechanism by which gas nanofilms affect splashing? Purely experimental approaches have been unable to unequivocally establish what mechanisms cause splashing so that theoretical approaches are now required to provide a deeper insight into the underlying physics. Advances in our theoretical understanding have, however, not matched progress in experimental analysis. Models based on a Navier-Stokes (NS) description of the gas and liquid predict that drops will always skate indefinitely over gas films so that liquid-solid contact never occurs; a result in conflict with experiments showing that skating only occurs under particular conditions, with well-defined transitions to contact-induced wetting. A major shortcoming of classical modelling in this context is its inability to describe evolving gas films of thickness h comparable to the mean free path in the gas l (70nm for air at atmospheric pressure), so that the Knudsen number Kn=l/h is not small and the NS-formulation becomes inaccurate. To properly understand these flows an entirely new modelling framework is required for the gas phase using models based on the Boltzmann equation (BE) of kinetic theory. It is the aim of this project to provide a framework for this new class of free-surface BE-NS flows. Our main focus in this project will be on the impact of drops on solids; however, estimates of gas film dimensions in numerous other flow configurations suggest violations of the NS-formulation are far more common than expected. These situations include the collisions of liquid drops, where bouncing-coalescing transitions depend on the ambient gas pressure (Qian & Law 1997); the formation of tip-singularities in free-surfaces (du Pont & Eggers 2006); the stability of nanobubbles on solids (Seddon et al 2011); the pinch-off of gas bubbles (Dollet et al 2008); the impact of projectiles on liquid surfaces (Truscott et al 2014); the initial stages of drop coalescence (Sprittles & Shikhmurzaev 2014); the creation of anti-bubbles from cylindrical air films (Beilharz et al 2015); and air entrainment in coating flows (Sprittles 2015). Our new BE-NS framework will also apply to these flows.